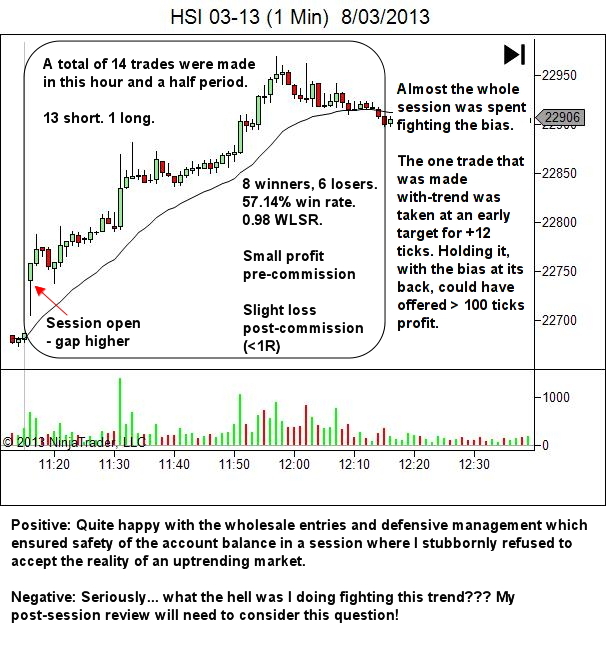 Life… the stuff that gets in the way of your trading! I know that everyone has difficulty at times fitting their trading in and around the rest of their life. Especially if you’re still working a full-time job and raising kids at the same time. But seriously, I can’t imagine a much worse time-zone for daytraders than the east coast of Australia. With the best choice and opportunity available during the UK and US market hours, that means either trading in our evening or overnight. The UK forex hours (8am-5pm GMT) are equivalent to my 6pm – 3am, the best part conflicting with family time (dinner, kids homework and never-ending trips to and from soccer training, keyboard lessons, guitar lessons etc etc etc). The US emini hours (9:30am-4:15pm ET) are equivalent to my 12:30am – 7:15am. That’s a killer. Not complaining, mind you. I wouldn’t ever trade this problem for a ‘normal’ job. And I accept their are some liquid markets in my normal daytime (SPI, HSI for example). I just haven’t found them to my liking. So, I accept it’s all my decision to live with this problem. For a long time I just forced my trading onto my family. Trading time was my work time. They came second. This obviously was not a wise plan and I consider myself incredibly lucky to still have a family. So now I place family first and select trading times that fit around other family responsibilities. Early UK market hours are only traded in small blocks of no greater than two hours, ONLY if family responsibilities allow me to trade at that time on that day, and ONLY if volatility is expected such as at the open or in the period immediately following a major news release. The bulk of my trading is therefore done once the kids are asleep, in either the forex UK/US overlap, or in the emini futures. That’s the best solution I’ve found so far for still allowing family-time. The side-effect though is that it increases the amount of ‘night-shift’ trading leading to even greater danger of fatigue induced error. The 5/12 rule discussed in the above article is designed to ensure I minimize the likelihood of trade error due to acute fatigue. If I don’t meet the 5/12 rule requirements, I don’t trade. When it comes to putting it into practice though, I’ve seriously let myself down and often do trade with less sleep. It’s easy to rationalize at the time – life just doesn’t allow me to get that much sleep, say for example when I trade till 3am, get to sleep by 4 and have to be up at 8 to drop the kids to school. End result – one very tired trader. So, here’s my latest plan – a four week trial of a biphasic sleep routine. Monophasic sleep is how most people do it. One sleep phase per 24 hour period, usually a single block of around 8 hours +/- 2. Sounds awesome, but not possible for me. Biphasic sleep involves two sleep phases per 24 hour period, often one longer one and a shorter one. I guess it’s like having a main sleep, plus a nap, just formalizing the nap period and ensuring it happens each day. Siesta time! Polyphasic sleep involves greater than two sleep phases per 24 hour period. Say for example 5 hours awake and 1 asleep, repeated four times in 24 hours. That is perhaps a bit extreme for me right now. Looking at further research on the net, and testimonies from others who have adopted this lifestyle, it appears that further benefits are an increased alertness, focus and the requirement for slightly less total sleep. The downside appears to be increased feelings of fatigue for the first week or so of the trial (no different to status quo) plus the fact that sometimes life doesn’t allow us the opportunity to take our second sleep (some flexibility may be necessary, to adjust the schedule as required). My wife already thinks I’m strange… so there’s no further downside in that department. Fatigue management is a favorite topic of mine, due to my interest in aviation and in particular aviation safety. In military aviation, in both a training and operational environment, fatigue management is recognized as an essential function of command, in order to minimize risk and enhance operational effectiveness. The same applies to the management of your trading business. As a trader, fatigue will reduce the quality of your work – your preparation, your market analysis, your trade execution, your trade management decisions, your focus, your patience, your ability to psychologically accept a loss and your ability to stick to the process of trading. Here’s a great quote on the dangers of fatigue, sticking to my military theme. “Some of the COs were awfully heartless and brutal. A few had no idea about how to command men or judge a soldier’s capabilities. Too often they would order young boys to lug a dead weight for miles, and when the young fellows reached the front they would be too exhausted to fight. I have seen them in tears, too tired to struggle on. They furnished an easy target for enemy gunners. More than one frail, green kid got cut down due to such incompetence in officer’s ranks. Ok, you’re not at war and your life is probably not at risk from the markets, but the results can still be devastating. As a retail trader, you’re CEO of your own trading business, as well as the trader. As CEO, are you pushing your trader too far, trying to achieve too much too soon, without sufficient time for rest and recuperation? If so, if not managed properly, the results can be financially devastating. Life is tough. There are many demands on an adult. For many of us, on top of a full-time job and a full-time family, we decide that we’re just not happy and need to work at developing another income stream to replace that job we despise. For varying reasons, often the allure of easy money, we’re attracted to the financial markets, and before we know it we’re burning the candle at both ends – effectively working at a third full-time commitment. Being so busy, sleep is the first thing that gets sacrificed. But how does that affect us, and our trading results?